Gifts from the Pirates: "It sounds like something on a very trite T-shirt, but life is what happens." "It sounds like something on a very trite T-shirt, but life is what happens." 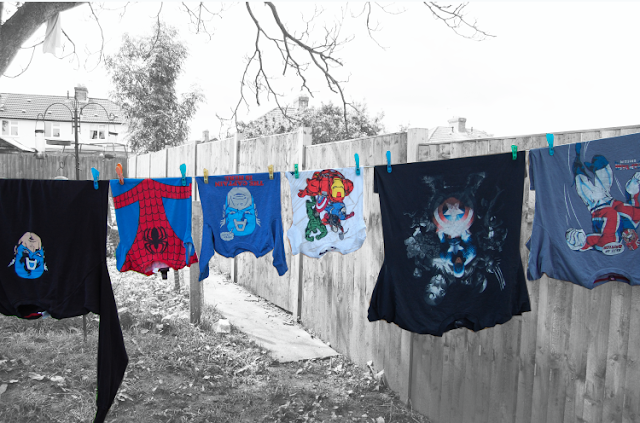 Last week i was accused of only putting Opeie in Super Hero T-Shirts, now I'm not going to deny this, but it is usually me that dresses both the boys in the mornings and obviously if the choice in their drawers is between a plain smart polo shirt or an awesome top with the Avengers on then clearly its not a difficult choice to make. I see the boys as an extension of myself. They love the things that i love and they want to be showing that off as much as i love showing them off. I am a doting father after all, that's what we do. I could think of much worse things that people put their kids in but that just boils down to a matter of taste. Their boys, they should be in tops covered in Super Heroes. 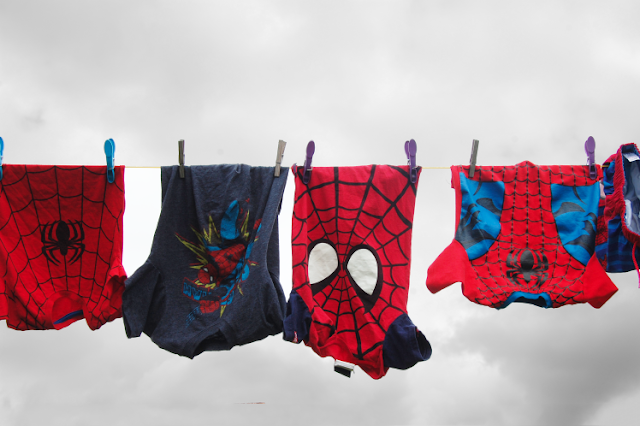 I was hanging the washing out last week and i realised that much of the space on the line had been monopolised by super hero attire so with this in mind and the spurring on of Mrs M's comment i decided to write this post. If your local and see me out and about then you will know that most days i will also be wearing a Captain America top or something else childish and nerdy. 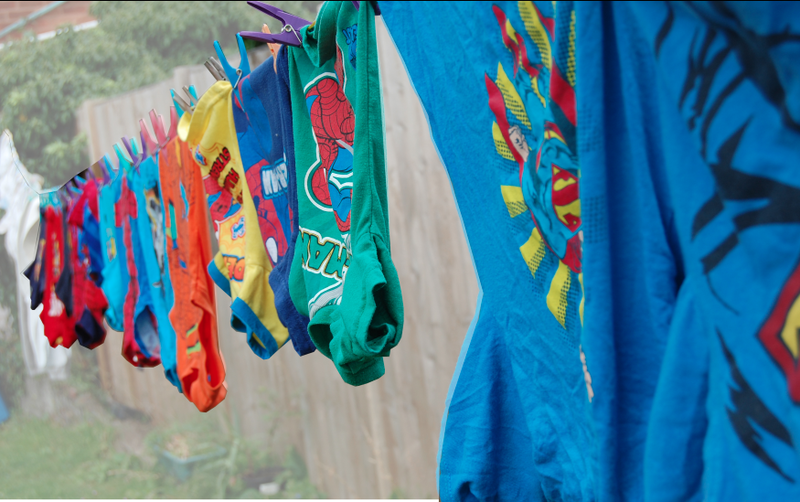 I am a big kid that loves colourful clothing. The boys love it and sometimes we wear matching character tops, its cute. Now Opeie has got a little older and is starting to understand things if he see's a top lying about that he fancies wearing he will let us know about it by holding it above his head. 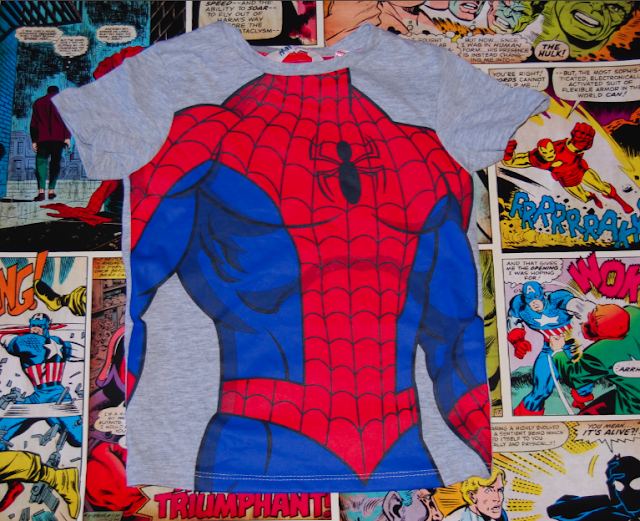 this will usually be one of his many Spider-Man tops or more recently his T-shirt to his Hulk PJ's. But also if hes wearing a top that he likes and he gets food down it or makes a mess he will do everything he can to stop us from taking it off him. 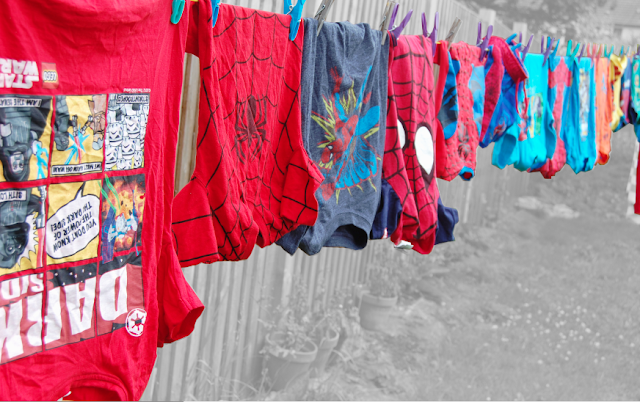 He's wearing his Spider-Man PJ's at the moment, he would happily keep them on all the time. Despite Mrs M's earlier comment, she mentioned to me today that she wishes she had brought a female spider-man T-Shirt that we had seen at universal studios when we had been away earlier in the year. so shes obviously not that bothered about all the super hero clothing, i think secretly she's just desperate to join in, and who could blame her were the cool kids, as Seth says. 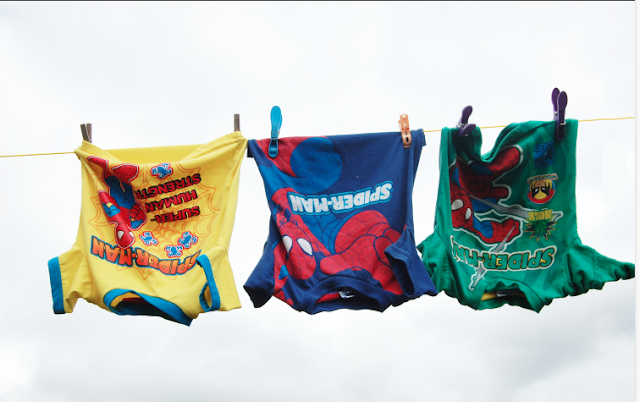 Well the boys will continue to be covered in Super hero print but i will do my best to even it out a bit...honest. Today though everything is clean and fresh off the line so i have my pick of the fun T-shirts so it would be rude not to take advantage of that. Which do you think he should wear? After visiting Chris and Michelle last weekend Opeie came away with another two great super hero T-shirts. He wore the Ironman one for the first time yesterday and it looked great on him, hes a proper little crime fighter. The Spider-Man T-shirt is for when hes a little older even though he's desperate to wear it now. Thank you so much guys we really appreciate your lovely gifts. I odon't mind the boys wearing superhero tshirts!! !